This fiftieth-anniversary edition commemorates Chaim Potok’s coming-of-age classic with a new introduction, critical essays, rare papers and photos, and much more. It’s the spring of 1944 and fifteen-year-olds Reuven Malter and Danny Saunders have lived five blocks apart all their lives. But they’ve never met, not until the day an accident during a softball game sparks an unlikely friendship. Soon these two boys—one expected to become a Hasidic rebbe, the other at ease with secular America—are drawn into one another’s worlds despite one father’s strong opposition. 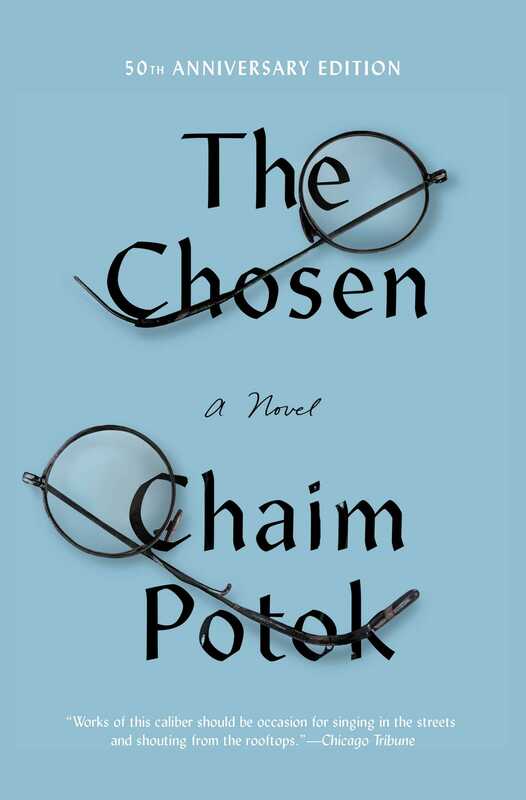 Set against the backdrop of WWII and the creation of the state of Israel, The Chosen is a poignant novel about transformation and tradition, growing up and growing wise, and finding yourself—even if that might mean leaving your community. FOR THE FIRST FIFTEEN YEARS of our lives, Danny and I lived within five blocks of each other and neither of us knew of the other’s existence. Danny’s block was heavily populated by the followers of his father, Russian Hasidic Jews in somber garb, whose habits and frames of reference were born on the soil of the land they had abandoned. They drank tea from samovars, sipping it slowly through cubes of sugar held between their teeth; they ate the foods of their homeland, talked loudly, occasionally in Russian, most often in a Russian Yiddish, and were fierce in their loyalty to Danny’s father. A block away lived another Hasidic sect, Jews from southern Poland, who walked the Brooklyn streets like specters, with their black hats, long black coats, black beards, and earlocks. These Jews had their own rabbi, their own dynastic ruler, who could trace his family’s position of rabbinic leadership back to the time of the Ba’al Shem Tov, the eighteenth-century founder of Hasidism, whom they all regarded as a God-invested personality. About three or four such Hasidic sects populated the area in which Danny and I grew up, each with its own rabbi, its own little synagogue, its own customs, its own fierce loyalties. On a Shabbat or festival morning, the members of each sect could be seen walking to their respective synagogues, dressed in their particular garb, eager to pray with their particular rabbi and forget the tumult of the week and the hungry grabbing for money which they needed to feed their large families during the seemingly endless Depression. The sidewalks of Williamsburg were cracked squares of cement, the streets paved with asphalt that softened in the stifling summers and broke apart into potholes in the bitter winters. Many of the houses were brownstones, set tightly together, none taller than three or four stories. In these houses lived Jews, Irish, Germans, and some Spanish Civil War refugee families that had fled the new Franco regime before the onset of the Second World War. Most of the stores were run by gentiles, but some were owned by Orthodox Jews, members of the Hasidic sects in the area. They could be seen behind their counters, wearing black skullcaps, full beards, and long earlocks, eking out their meager livelihoods and dreaming of Shabbat and festivals when they could close their stores and turn their attention to their prayers, their rabbi, their God. Every Orthodox Jew sent his male children to a yeshiva, a Jewish parochial school, where they studied from eight or nine in the morning to four or five in the evening. On Fridays the students were let out at about one o’clock to prepare for the Shabbat. Jewish education was compulsory for the Orthodox, and because this was America and not Europe, English education was compulsory as well—so each student carried a double burden: Hebrew studies in the mornings and English studies in the afternoons. The test of intellectual excellence, however, had been reduced by tradition and unvoiced unanimity to a single area of study: Talmud. Virtuosity in Talmud was the achievement most sought after by every student of a yeshiva, for it was the automatic guarantee of a reputation for brilliance. Danny attended the small yeshiva established by his father. Outside of the Williamsburg area, in Crown Heights, I attended the yeshiva in which my father taught. This latter yeshiva was somewhat looked down upon by the students of other Jewish parochial schools of Brooklyn: it offered more English subjects than the required minimum, and it taught its Jewish subjects in Hebrew rather than Yiddish. Most of the students were children of immigrant Jews who preferred to regard themselves as having been emancipated from the fenced-off ghetto mentality typical of the other Jewish parochial schools in Brooklyn. Danny and I probably would never have met—or we would have met under altogether different circumstances—had it not been for America’s entry into the Second World War and the desire this bred on the part of some English teachers in the Jewish parochial schools to show the gentile world that yeshiva students were as physically fit, despite their long hours of study, as any other American student. They went about proving this by organizing the Jewish parochial schools in and around our area into competitive leagues, and once every two weeks the schools would compete against one another in a variety of sports. I became a member of my school’s varsity softball team. On a Sunday afternoon in early June, the fifteen members of my team met with our gym instructor in the play yard of our school. It was a warm day, and the sun was bright on the asphalt floor of the yard. The gym instructor was a short, chunky man in his early thirties who taught in the mornings in a nearby public high school and supplemented his income by teaching in our yeshiva during the afternoons. He wore a white polo shirt, white pants, and white sweater, and from the awkward way the little black skullcap sat perched on his round, balding head, it was clearly apparent that he was not accustomed to wearing it with any sort of regularity. When he talked he frequently thumped his right fist into his left palm to emphasize a point. He walked on the balls of his feet, almost in imitation of a boxer’s ring stance, and he was fanatically addicted to professional baseball. He had nursed our softball team along for two years, and by a mixture of patience, luck, shrewd manipulations during some tight ball games, and hard, fist-thumping harangues calculated to shove us into a patriotic awareness of the importance of athletics and physical fitness for the war effort, he was able to mold our original team of fifteen awkward fumblers into the top team of our league. His name was Mr. Galanter, and all of us wondered why he was not off somewhere fighting in the war. That afternoon we were scheduled to play the winning team of another neighborhood league, a team with a reputation for wild, offensive slugging and poor fielding. Mr. Galanter said he was counting upon our infield to act as a solid defensive front. Throughout the warm-up period, with only our team in the yard, he kept thumping his right fist into his left palm and shouting at us to be a solid defensive front. We batted and threw the ball around, and it was warm and sunny, and there was the smooth, happy feeling of the summer soon to come, and the tight excitement of the ball game. We wanted very much to win, both for ourselves and, more especially, for Mr. Galanter, for we had all come to like his fist-thumping sincerity. To the rabbis who taught in the Jewish parochial schools, baseball was an evil waste of time, a spawn of the potentially assimilationist English portion of the yeshiva day. But to the students of most of the parochial schools, an inter-league baseball victory had come to take on only a shade less significance than a top grade in Talmud, for it was an unquestioned mark of one’s Americanism, and to be counted a loyal American had become increasingly important to us during these last years of the war. So Mr. Galanter stood near home plate, shouting instructions and words of encouragement, and we batted and tossed the ball around. I walked off the field for a moment to set up my eyeglasses for the game. I wore shell-rimmed glasses, and before every game I would bend the earpieces in so the glasses would stay tight on my head and not slip down the bridge of my nose when I began to sweat. I always waited until just before a game to bend down the earpieces, because, bent, they would cut into the skin over my ears, and I did not want to feel the pain a moment longer than I had to. The tops of my ears would be sore for days after every game, but better that, I thought, than the need to keep pushing my glasses up the bridge of my nose or the possibility of having them fall off suddenly during an important play. Davey Cantor, one of the boys who acted as a replacement if a first-stringer had to leave the game, was standing near the wire screen behind home plate. He was a short boy, with a round face, dark hair, owlish glasses, and a very Semitic nose. He watched me fix my glasses. “You’re looking good out there, Reuven,” he told me. He stared at me through his glasses. “You think so?” he asked. “You’ll see,” Davey Cantor said. “Are you playing?” I asked him. “Yes, sir!” I said, and ran back out to my position at second base. We threw the ball around a few more minutes, and then I went up to home plate for some batting practice. I hit a long one out to left field, and then a fast one to the shortstop, who fielded it neatly and whipped it to first. I had the bat ready for another swing when someone said, “Here they are,” and I rested the bat on my shoulder and saw the team we were going to play turn up our block and come into the yard. I saw Davey Cantor kick nervously at the wire screen behind home plate, then put his hands into the pockets of his dungarees. His eyes were wide and gloomy behind his owlish glasses. I watched them come into the yard. There were fifteen of them, and they were dressed alike in white shirts, dark pants, white sweaters, and small black skullcaps. In the fashion of the very Orthodox, their hair was closely cropped, except for the area near their ears from which mushroomed the untouched hair that tumbled down into the long side curls. Some of them had the beginnings of beards, straggly tufts of hair that stood in isolated clumps on their chins, jawbones, and upper lips. They all wore the traditional undergarment beneath their shirts, and the tzitzit, the long fringes appended to the four corners of the garment, came out above their belts and swung against their pants as they walked. These were the very Orthodox, and they obeyed literally the Biblical commandment And ye shall look upon it, which pertains to the fringes. In contrast, our team had no particular uniform, and each of us wore whatever he wished: dungarees, shorts, pants, polo shirts, sweatshirts, even undershirts. Some of us wore the garment, others did not. None of us wore the fringes outside his trousers. The only element of uniform that we had in common was the small, black skullcap which we, too, wore. They came up to the first-base side of the wire screen behind home plate and stood there in a silent black-and-white mass, holding bats and balls and gloves in their hands. I looked at them. They did not seem to me to present any picture of ferocity. I saw Davey Cantor kick again at the wire screen, then walk away from them to the third-base line, his hands moving nervously against his dungarees. Mr. Galanter smiled and started toward them, moving quickly on the balls of his feet, his skullcap perched precariously on the top of his balding head. A man disentangled himself from the black-and-white mass of players and took a step forward. He looked to be in his late twenties and wore a black suit, black shoes, and a black hat. He had a black beard, and he carried a book under one arm. He was obviously a rabbi, and I marveled that the yeshiva had placed a rabbi instead of an athletic coach over its team. Mr. Galanter came up to him and offered his hand. “We are ready to play,” the rabbi said in Yiddish, shaking Mr. Galanter’s hand with obvious uninterest. “Fine,” Mr. Galanter said in English, smiling. The rabbi looked out at the field. “You played already?” he asked. “How’s that?” Mr. Galanter said. “How’s that?” Mr. Galanter said again, looking surprised. “We want five minutes,” the rabbi insisted. “Well—” Mr. Galanter said. He was no longer smiling. He always liked to go right into a game when we played in our own yard. It kept us from cooling off, he said. “Tell your people to leave the field,” the rabbi said. The players scrambled off the field. The black-and-white mass near the wire screen remained intact. The young rabbi turned and faced his team. Then he stepped aside, and the black-and-white mass dissolved into fifteen individual players who came quickly onto the field. One of them, a tall boy with sand-colored hair and long arms and legs that seemed all bones and angles, stood at home plate and commenced hitting balls out to the players. He hit a few easy grounders and pop-ups, and the fielders shouted encouragement to one another in Yiddish. They handled themselves awkwardly, dropping easy grounders, throwing wild, fumbling fly balls. I looked over at the young rabbi. He had sat down on the bench near the wire screen and was reading his book. Behind the wire screen was a wide area, and Mr. Galanter kept us busy there throwing balls around. But there was a broad smile on his face. Now that he was actually seeing the other team, he seemed not at all concerned about the outcome of the game. In the interim between throwing a ball and having it thrown back to me, I told myself that I liked Mr. Galanter, and I wondered about his constant use of war expressions and why he wasn’t in the army. Davey Cantor came past me, chasing a ball that had gone between his legs. “Some murderers.” I grinned at him. “You’ll see,” he said as he bent to retrieve the ball. The ball was coming back to me, and I caught it neatly and flipped it back. “Who’s the one batting?” I asked. “Reb Saunders’s son,” Davey Cantor said, blinking his eyes. “You’ll see,” Davey Cantor said, and ran off with his ball. My father, who had no love at all for Hasidic communities and their rabbinic overlords, had told me about Rabbi Isaac Saunders and the zealousness with which he ruled his people and settled questions of Jewish law. I saw Mr. Galanter look at his wristwatch, then stare out at the team on the field. The five minutes were apparently over, but the players were making no move to abandon the field. Danny Saunders was now at first base, and I noticed that his long arms and legs were being used to good advantage, for by stretching and jumping he was able to catch most of the wild throws that came his way. Mr. Galanter went over to the young rabbi, who was still sitting on the bench and reading. “It’s five minutes,” he said. The rabbi looked up from his book. “Ah?” he said. “The five minutes are up,” Mr. Galanter said. The rabbi stared out at the field. “Enough!” he shouted in Yiddish. “It’s time to play!” Then he looked down at the book and resumed his reading. The players threw the ball around for another minute or two, and then slowly came off the field. Danny Saunders walked past me, still wearing his first baseman’s glove. He was a good deal taller than I, and in contrast to my somewhat ordinary but decently proportioned features and dark hair, his face seemed to have been cut from stone. His chin, jaw, and cheekbones were made up of jutting hard lines, his nose was straight and pointed, his lips full, rising to a steep angle from the center point beneath his nose and then slanting off to form a too-wide mouth. His eyes were deep blue, and the sparse tufts of hair on his chin, jawbones, and upper lip, the close-cropped hair on his head, and the flow of side curls along his ears were the color of sand. He moved in a loose-jointed, disheveled sort of way, all arms and legs, talking in Yiddish to one of his teammates and ignoring me completely as he passed by. I told myself that I did not like his Hasidic-bred sense of superiority and that it would be a great pleasure to defeat him and his team in this afternoon’s game. The umpire, a gym instructor from a parochial school two blocks away, called the teams together to determine who would bat first. I saw him throw a bat into the air. It was caught and almost dropped by a member of the other team. During the brief hand-over-hand choosing, Davey Cantor came over and stood next to me. “They’re a snooty bunch,” I told him. “You’ll see,” Davey Cantor said, looking at me gloomily. “I’m not being funny,” he said, looking hurt. “Some murderers,” I told him, and laughed. The teams began to disperse. We had lost the choosing, and they had decided to bat first. We scampered onto the field. I took up my position at second base. I saw the young rabbi sitting on the bench near the wire fence and reading. We threw a ball around for a minute. Mr. Galanter stood alongside third base, shouting his words of encouragement at us. It was warm, and I was sweating a little and feeling very good. Then the umpire, who had taken up his position behind the pitcher, called for the ball and someone tossed it to him. He handed it to the pitcher and shouted, “Here we go! Play ball!” We settled into our positions. A short, thin boy came up to the plate and stood there with his feet together, holding the bat awkwardly over his head. He wore steel-rimmed glasses that gave his face a pinched, old man’s look. He swung wildly at the first pitch, and the force of the swing spun him completely around. His earlocks lifted off the sides of his head and followed him around in an almost horizontal circle. Then he steadied himself and resumed his position near the plate, short, thin, his feet together, holding his bat over his head in an awkward grip. The umpire called the strike in a loud, clear voice, and I saw Sidney Goldberg look over at me and grin broadly. “If he studies Talmud like that, he’s dead,” Sidney Goldberg said. The next pitch was too high, and the boy chopped at it, lost his bat and fell forward on his hands. Sidney Goldberg and I looked at each other again. Sidney was in my class. We were similar in build, thin and lithe, with somewhat spindly arms and legs. He was not a very good student, but he was an excellent shortstop. We lived on the same block and were good but not close friends. He was dressed in an undershirt and dungarees and was not wearing the four-cornered garment. I had on a light blue shirt and dark blue work pants, and I wore the four-cornered garment under the shirt. The short, thin boy was back at the plate, standing with his feet together and holding the bat in his awkward grip. He let the next pitch go by, and the umpire called it a strike. I saw the young rabbi look up a moment from his book, then resume reading. “Two more just like that!” I shouted encouragingly to the pitcher. “Two more, Schwartzie!” And I thought to myself, Some murderers. I saw Danny Saunders go over to the boy who had just struck out and talk to him. The boy looked down and seemed to shrivel with hurt. He hung his head and walked away behind the wire screen. Another short, thin boy took his place at the plate. I looked around for Davey Cantor but could not see him. The boy at bat swung wildly at the first two pitches and missed them both. He swung again at the third pitch, and I heard the loud thwack of the bat as it connected with the ball, and saw the ball move in a swift, straight line toward Sidney Goldberg, who caught it, bobbled it for a moment, and finally got it into his glove. He tossed the ball to me, and we threw it around. I saw him take off his glove and shake his left hand. “That hurt,” he said, grinning at me. “Good catch,” I told him. “That hurt like hell,” he said, and put his glove back on his hand. The batter who stood now at the plate was broad-shouldered and built like a bear. He swung at the first pitch, missed, then swung again at the second pitch and sent the ball in a straight line over the head of the third baseman into left field. I scrambled to second, stood on the base and shouted for the ball. I saw the left fielder pick it up on the second bounce and relay it to me. It was coming in a little high, and I had my glove raised for it. I felt more than saw the batter charging toward second, and as I was getting my glove on the ball he smashed into me like a truck. The ball went over my head, and I fell forward heavily onto the asphalt floor of the yard, and he passed me, going toward third, his fringes flying out behind him, holding his skullcap to his head with his right hand so it would not fall off. Abe Goodstein, our first baseman, retrieved the ball and whipped it home, and the batter stood at third, a wide grin on his face. The yeshiva team exploded into wild cheers and shouted loud words of congratulations in Yiddish to the batter. Sidney Goldberg helped me get to my feet. “Wow!” I said, taking a few deep breaths. I had scraped the palm of my right hand. “What a momzer!” Sidney Goldberg said. “Safe at third,” the umpire repeated. “I’m okay,” I said, taking another deep breath. Mr. Galanter walked angrily off the field. “Play ball!” the umpire shouted. The yeshiva team quieted down. I saw that the young rabbi was now looking up from his book and smiling faintly. A tall, thin player came up to the plate, set his feet in correct position, swung his bat a few times, then crouched into a waiting stance. I saw it was Danny Saunders. I opened and closed my right hand, which was still sore from the fall. “Move back! Move back!” Mr. Galanter was shouting from alongside third base, and I took two steps back. The first pitch was wild, and the yeshiva team burst into loud laughter. The young rabbi was sitting on the bench, watching Danny Saunders intently. The next pitch was about a foot over Danny Saunders’s head, and the yeshiva team howled with laughter. Sidney Goldberg and I looked at each other. I saw Mr. Galanter standing very still alongside third, staring at the pitcher. The rabbi was still watching Danny Saunders. The next pitch left Schwartzie’s hand in a long, slow line, and before it was halfway to the plate I knew Danny Saunders would try for it. I knew it from the way his left foot came forward and the bat snapped back and his long, thin body began its swift pivot. I tensed, waiting for the sound of the bat against the ball, and when it came it sounded like a gunshot. For a wild fraction of a second I lost sight of the ball. Then I saw Schwartzie dive to the ground, and there was the ball coming through the air where his head had been, and I tried for it but it was moving too fast, and I barely had my glove raised before it was in center field. It was caught on a bounce and thrown to Sidney Goldberg, but by that time Danny Saunders was standing solidly on my base and the yeshiva team was screaming with joy. Mr. Galanter called for time and walked over to talk to Schwartzie. Sidney Goldberg nodded to me, and the two of us went over to them. “I saw it,” Mr. Galanter said grimly. “That was too fast to stop, Mr. Galanter,” I said in Schwartzie’s defense. “God, that ball could’ve killed me!” Schwartzie said again. “You want to go on pitching?” Mr. Galanter said. A thin sheen of sweat covered his forehead, and he looked very grim. “I’m trying my best, Mr. Galanter,” Schwartzie said. Mr. Galanter nodded, still looking grim, and started off the field. I saw him take a handkerchief out of his pocket and wipe his forehead. The umpire came over to us. “You boys planning to chat here all afternoon?” he asked. He was a squat man in his late forties, and he looked impatient. “No, sir,” I said very politely, and Sidney and I ran back to our places. Danny Saunders was standing on my base. His white shirt was pasted to his arms and back with sweat. “That was a nice shot,” I offered. He looked at me curiously and said nothing. “You always hit it like that to the pitcher?” I asked. He smiled faintly. “You’re Reuven Malter,” he said in perfect English. He had a low, nasal voice. “That’s right,” I said, wondering where he had heard my name. “I told my team we’re going to kill you apikorsim this afternoon.” He said it flatly, without a trace of expression in his voice. I walked away from him and took up my position near the base. I looked toward the wire screen and saw Davey Cantor standing there, staring out at the field, his hands in his pockets. I crouched down quickly, because Schwartzie was going into his pitch. The batter swung wildly at the first two pitches and missed each time. The next one was low, and he let it go by, then hit a grounder to the first baseman, who dropped it, flailed about for it wildly, and recovered it in time to see Danny Saunders cross the plate. The first baseman stood there for a moment, drenched in shame, then tossed the ball to Schwartzie. I saw Mr. Galanter standing near third base, wiping his forehead. The yeshiva team had gone wild again, and they were all trying to get to Danny Saunders and shake his hand. I saw the rabbi smile broadly, then look down at his book and resume reading. Sidney Goldberg came over to me. “What did Saunders tell you?” he asked. He stared at me. “Those are nice people, those yeshiva people,” he said, and walked slowly back to his position. The next batter hit a long fly ball to right field. It was caught on the run. We were standing near the wire screen, forming a tight circle around Mr. Galanter. The circle broke up, and Sidney Goldberg walked to the plate, carrying a bat. I saw the rabbi was still sitting on the bench, reading. I started to walk around behind him to see what book it was, when Davey Cantor came over, his hands in his pockets, his eyes still gloomy. “So you told me. So what?” I was in no mood for his feelings of doom, and I let my voice show it. “They can hit,” I said. I watched Sidney Goldberg let a strike go by and said nothing. “How’s your hand?” Davey Cantor asked. “Dov Shlomowitz,” Davey Cantor said. “Like his name, that’s what he is,” he added in Hebrew. “Dov” is the Hebrew word for bear. “He felt like a truck,” I said, watching Sidney Goldberg step back from a close pitch. “Well, good for your father,” I said. I saw his face break into a happy smile, and just then Sidney Goldberg hit a fast, low grounder and raced off to first. The ball went right through the legs of the shortstop and into center field. “Hold it at first!” Mr. Galanter screamed at him, and Sidney stopped at first and stood on the base. The ball had been tossed quickly to second base. The second baseman looked over toward first, then threw the ball to the pitcher. The rabbi glanced up from the book for a moment, then went back to his reading. “Malter, coach him at first!” Mr. Galanter shouted, and I ran up the base line. “They can hit, but they can’t field,” Sidney Goldberg said, grinning at me as I came to a stop alongside the base. “Davey Cantor says they’re murderers,” I said. “Old gloom-and-doom Davey,” Sidney Goldberg said, grinning. Danny Saunders was standing away from the base, making a point of ignoring us both. The next batter hit a high fly to the second baseman, who caught it, dropped it, retrieved it, and made a wild attempt at tagging Sidney Goldberg as he raced past him to second. “Safe all around!” the umpire called, and our team burst out with shouts of joy. Mr. Galanter was smiling. The rabbi continued reading, and I saw that he was now slowly moving the upper part of his body back and forth. “Keep your eyes open, Sidney!” I shouted from alongside first base. I saw Danny Saunders look at me, then look away. Some murderers, I thought. Shleppers is more like it. “If it’s on the ground, run like hell,” I said to the batter who had just come onto first base, and he nodded at me. He was our third baseman, and he was about my size. “If they keep fielding like that we’ll be here till tomorrow,” he said, and I grinned at him. I saw Mr. Galanter talking to the next batter, who was nodding his head vigorously. He stepped to the plate, hit a hard grounder to the pitcher, who fumbled it for a moment and then threw it to first. I saw Danny Saunders stretch for it and stop it. As I ran up to the plate to bat, I almost laughed aloud at the pitcher’s stupidity. He had thrown it to first rather than third, and now we had Sidney Goldberg on third, and a man on second. I hit a grounder to the shortstop and instead of throwing it to second he threw it to first, wildly, and again Danny Saunders stretched and stopped the ball. But I beat the throw and heard the umpire call out, “Safe all around! One in!” And everyone on our team was patting Sidney Goldberg on the back. Mr. Galanter smiled broadly. He looked at me, then looked slowly away, his face expressionless. Schwartzie was at the plate, swinging his bat. He waved a hand at me. Schwartzie took two balls and a strike, then I saw him begin to pivot on the fourth pitch. The runner on third started for home. He was almost halfway down the base line when the bat sent the ball in a hard line drive straight to the third baseman, the short, thin boy with the spectacles and the old man’s face, who had stood hugging the base and who now caught the ball more with his stomach than with his glove, managed somehow to hold on to it, and stood there, looking bewildered and astonished. I returned to first and saw our player who had been on third and who was now halfway to home plate turn sharply and start a panicky race back. “Step on the base!” Danny Saunders screamed in Yiddish across the field, and more out of obedience than awareness the third baseman put a foot on the base. The yeshiva team howled its happiness and raced off the field. Danny Saunders looked at me, started to say something, stopped, then walked quickly away. I saw Mr. Galanter going back up the third-base line, his face grim. The rabbi was looking up from his book and smiling. I took up my position near second base, and Sidney Goldberg came over to me. “Why’d he have to take off like that?” he asked. I glared over at our third baseman, who was standing near Mr. Galanter and looking very dejected. “He was in a hurry to win the war,” I said bitterly. “What a jerk,” Sidney Goldberg said. Sidney Goldberg went quickly to his position. I stood still and waited. It was hot, and I was sweating beneath my clothes. I felt the earpieces of my glasses cutting into the skin over my ears, and I took the glasses off for a moment and ran a finger over the pinched ridges of skin, then put them back on quickly because Schwartzie was going into a windup. I crouched down, waiting, remembering Danny Saunders’s promise to his team that they would kill us apikorsim. The word had meant, originally, a Jew educated in Judaism who denied basic tenets of his faith, like the existence of God, the revelation, the resurrection of the dead. To people like Reb Saunders, it also meant any educated Jew who might be reading, say, Darwin, and who was not wearing side curls and fringes outside his trousers. I was an apikoros to Danny Saunders, despite my belief in God and Torah, because I did not have side curls and was attending a parochial school where too many English subjects were offered and where Jewish subjects were taught in Hebrew instead of Yiddish, both unheard-of sins, the former because it took time away from the study of Torah, the latter because Hebrew was the Holy Tongue and to use it in ordinary classroom discourse was a desecration of God’s Name. I had never really had any personal contact with this kind of Jew before. My father had told me he didn’t mind their beliefs. What annoyed him was their fanatic sense of righteousness, their absolute certainty that they and they alone had God’s ear, and every other Jew was wrong, totally wrong, a sinner, a hypocrite, an apikoros, and doomed, therefore, to burn in hell. I found myself wondering again how they had learned to hit a ball like that if time for the study of Torah was so precious to them and why they had sent a rabbi along to waste his time sitting on a bench during a ball game. Standing on the field and watching the boy at the plate swing at a high ball and miss, I felt myself suddenly very angry, and it was at that point that for me the game stopped being merely a game and became a war. The fun and excitement was out of it now. Somehow the yeshiva team had translated this afternoon’s baseball game into a conflict between what they regarded as their righteousness and our sinfulness. I found myself growing more and more angry, and I felt the anger begin to focus itself upon Danny Saunders, and suddenly it was not at all difficult for me to hate him. Schwartzie let five of their men come up to the plate that half inning and let one of those five score. Sometime during that half inning, one of the members of the yeshiva team had shouted at us in Yiddish, “Burn in hell, you apikorsim!” and by the time that half inning was over and we were standing around Mr. Galanter near the wire screen, all of us knew that this was not just another ball game. Mr. Galanter was sweating heavily, and his face was grim. All he said was, “We fight it careful from now on. No more mistakes.” He said it very quietly, and we were all quiet, too, as the batter stepped up to the plate. We proceeded to play a slow, careful game, bunting whenever we had to, sacrificing to move runners forward, obeying Mr. Galanter’s instructions. I noticed that no matter where the runners were on the bases, the yeshiva team always threw to Danny Saunders, and I realized that they did this because he was the only infielder who could be relied upon to stop their wild throws. Sometime during the inning, I walked over behind the rabbi and looked over his shoulder at the book he was reading. I saw the words were Yiddish. I walked back to the wire screen. Davey Cantor came over and stood next to me, but he remained silent. We scored only one run that inning, and we walked onto the field for the first half of the third inning with a sense of doom. Dov Shlomowitz came up to the plate. He stood there like a bear, the bat looking like a matchstick in his beefy hands. Schwartzie pitched, and he sliced one neatly over the head of the third baseman for a single. The yeshiva team howled, and again one of them called out to us in Yiddish, “Burn, you apikorsim!” and Sidney Goldberg and I looked at each other without saying a word. Mr. Galanter was standing alongside third base, wiping his forehead. The rabbi was sitting quietly, reading his book. I took off my glasses and rubbed the tops of my ears. I felt a sudden momentary sense of unreality, as if the play yard, with its black asphalt floor and its white base lines, were my entire world now, as if all the previous years of my life had led me somehow to this one ball game, and all the future years of my life would depend upon its outcome. I stood there for a moment, holding the glasses in my hand and feeling frightened. Then I took a deep breath, and the feeling passed. It’s only a ball game, I told myself. What’s a ball game? Mr. Galanter was shouting at us to move back. I was standing a few feet to the left of second, and I took two steps back. I saw Danny Saunders walk up to the plate, swinging a bat. The yeshiva team was shouting at him in Yiddish to kill us apikorsim. Schwartzie turned around to check the field. He looked nervous and was taking his time. Sidney Goldberg was standing up straight, waiting. We looked at each other, then looked away. Mr. Galanter stood very still alongside third base, looking at Schwartzie. The first pitch was low, and Danny Saunders ignored it. The second one started to come in shoulder-high, and before it was two thirds of the way to the plate, I was already standing on second base. My glove was going up as the bat cracked against the ball, and I saw the ball move in a straight line directly over Schwartzie’s head, high over his head, moving so fast he hadn’t even had time to regain his balance from the pitch before it went past him. I saw Dov Shlomowitz heading toward me and Danny Saunders racing to first, and I heard the yeshiva team shouting and Sidney Goldberg screaming, and I jumped, pushing myself upward off the ground with all the strength I had in my legs and stretching my glove hand till I thought it would pull out of my shoulder. The ball hit the pocket of my glove with an impact that numbed my hand and went through me like an electric shock, and I felt the force pull me backward and throw me off balance, and I came down hard on my left hip and elbow. I saw Dov Shlomowitz whirl and start back to first, and I pushed myself up into a sitting position and threw the ball awkwardly to Sidney Goldberg, who caught it and whipped it to first. I heard the umpire scream “Out!” and Sidney Goldberg ran over to help me to my feet, a look of disbelief and ecstatic joy on his face. Mr. Galanter shouted “Time!” and came racing onto the field. Schwartzie was standing in his pitcher’s position with his mouth open. Danny Saunders stood on the base line a few feet from first, where he had stopped after I had caught the ball, staring out at me, his face frozen to stone. The rabbi was staring at me, too, and the yeshiva team was deathly silent. I saw the rest of our team had suddenly come back to life and was throwing the ball around and talking up the game. I showed him the elbow. I had scraped it, but the skin had not been broken. “That was a good play,” Mr. Galanter said, beaming at me. I saw his face was still covered with sweat, but he was smiling broadly now. I took off the glove, and Mr. Galanter poked and bent the wrist and fingers of the hand. “I can’t get over that catch,” Sidney Goldberg said. “You threw it real good to first,” I told him. We grinned at each other, and went to our positions. Two more of the yeshiva team got to bat that inning. The first one hit a single, and the second one sent a high fly to short, which Sidney Goldberg caught without having to move a step. We scored two runs that inning and one run the next, and by the top half of the fifth inning we were leading five to three. Four of their men had stood up to bat during the top half of the fourth inning, and they had got only a single on an error to first. When we took to the field in the top half of the fifth inning, Mr. Galanter was walking back and forth alongside third on the balls of his feet, sweating, smiling, grinning, wiping his head nervously; the rabbi was no longer reading; the yeshiva team was silent as death. Davey Cantor was playing second, and I stood in the pitcher’s position. Schwartzie had pleaded exhaustion, and since this was the final inning—our parochial school schedules only permitted us time for five-inning games—and the yeshiva team’s last chance at bat, Mr. Galanter was taking no chances and told me to pitch. Davey Cantor was a poor fielder, but Mr. Galanter was counting on my pitching to finish off the game. My left hand was still sore from the catch, and the wrist hurt whenever I caught a ball, but the right hand was fine, and the pitches went in fast and dropped into the curve just when I wanted them to. Dov Shlomowitz stood at the plate, swung three times at what looked to him to be perfect pitches, and hit nothing but air. He stood there looking bewildered after the third swing, then slowly walked away. We threw the ball around the infield, and Danny Saunders came up to the plate. The members of the yeshiva team stood near the wire fence, watching Danny Saunders. They were very quiet. The rabbi was sitting on the bench, his book closed. Mr. Galanter was shouting at everyone to move back. Danny Saunders swung his bat a few times, then fixed himself into position and looked out at me. Here’s a present from an apikoros, I thought, and let go the ball. It went in fast and straight, and I saw Danny Saunders’s left foot move out and his bat go up and his body begin to pivot. He swung just as the ball slid into its curve, and the bat cut savagely through empty air, twisting him around and sending him off balance. His black skullcap fell off his head, and he regained his balance and bent quickly to retrieve it. He stood there for a moment, very still, staring out at me. Then he resumed his position at the plate. The ball came back to me from the catcher, and my wrist hurt as I caught it. The yeshiva team was very quiet, and the rabbi had begun to chew his lip. I lost control of the next pitch, and it was wide. On the third pitch, I went into a long, elaborate windup and sent him a slow, curving blooper, the kind a batter always wants to hit and always misses. He ignored it completely, and the umpire called it a ball. I felt my left wrist begin to throb as I caught the throw from the catcher. I was hot and sweaty, and the earpieces of my glasses were cutting deeply into the flesh above my ears as a result of the head movements that went with my pitching. Danny Saunders stood very still at the plate, waiting. Okay, I thought, hating him bitterly. Here’s another present. The ball went to the plate fast and straight, and dropped just below his swing. He checked himself with difficulty so as not to spin around, but he went off his balance again and took two or three staggering steps forward before he was able to stand up straight. The catcher threw the ball back, and I winced at the pain in my wrist. I took the ball out of the glove, held it in my right hand, and turned around for a moment to look out at the field and let the pain in my wrist subside. When I turned back I saw that Danny Saunders hadn’t moved. He was holding his bat in his left hand, standing very still and staring at me. His eyes were dark, and his lips were parted in a crazy, idiot grin. I heard the umpire yell “Play ball!” but Danny Saunders stood there, staring at me and grinning. I turned and looked out at the field again, and when I turned back he was still standing there, staring at me and grinning. I could see his teeth between his parted lips. I took a deep breath and felt myself wet with sweat. I wiped my right hand on my pants and saw Danny Saunders step slowly to the plate and set his legs in position. He was no longer grinning. He stood looking at me over his left shoulder, waiting. I wanted to finish it quickly because of the pain in my wrist, and I sent in another fast ball. I watched it head straight for the plate. I saw him go into a sudden crouch, and in the fraction of a second before he hit the ball I realized that he had anticipated the curve and was deliberately swinging low. I was still a little off balance from the pitch, but I managed to bring my glove hand up in front of my face just as he hit the ball. I saw it coming at me, and there was nothing I could do. It hit the finger section of my glove, deflected off, smashed into the upper rim of the left lens of my glasses, glanced off my forehead, and knocked me down. I scrambled around for it wildly, but by the time I got my hand on it Danny Saunders was standing safely on first. I heard Mr. Galanter call time, and everyone on the field came racing over to me. My glasses lay shattered on the asphalt floor, and I felt a sharp pain in my left eye when I blinked. My wrist throbbed, and I could feel the bump coming up on my forehead. I looked over at first, but without my glasses Danny Saunders was only a blur. I imagined I could still see him grinning. I saw Mr. Galanter put his face next to mine. It was sweaty and full of concern. I wondered what all the fuss was about. I had only lost a pair of glasses, and we had at least two more good pitchers on the team. “Are you all right, boy?” Mr. Galanter was saying. He looked at my face and forehead. “Somebody wet a handkerchief with cold water!” he shouted. I wondered why he was shouting. His voice hurt my head and rang in my ears. I saw Davey Cantor run off, looking frightened. I heard Sidney Goldberg say something, but I couldn’t make out his words. Mr. Galanter put his arm around my shoulders and walked me off the field. He sat me down on the bench next to the rabbi. Without my glasses everything more than about ten feet away from me was blurred. I blinked and wondered about the pain in my left eye. I heard voices and shouts, and then Mr. Galanter was putting a wet handkerchief on my head. “You feel dizzy, boy?” he said. “I’m all right,” I said, and wondered why my voice sounded husky and why talking hurt my head. He went away. I sat on the bench next to the rabbi, who looked at me once, then looked away. I heard shouts in Yiddish. The pain in my left eye was so intense I could feel it in the base of my spine. I sat on the bench a long time, long enough to see us lose the game by a score of eight to seven, long enough to hear the yeshiva team shout with joy, long enough to begin to cry at the pain in my left eye, long enough for Mr. Galanter to come over to me at the end of the game, take one look at my face and go running out of the yard to call a cab. This reading group guide for The Chosen includes an introduction, discussion questions, and ideas for enhancing your book club. The suggested questions are intended to help your reading group find new and interesting angles and topics for your discussion. We hope that these ideas will enrich your conversation and increase your enjoyment of the book. Although Reuven Malter and Danny Saunders have lived within blocks of each other in Brooklyn for fifteen years, they do not meet until the day they step onto a local play yard as fierce opponents in a wartime baseball game that represents much more than mere sport. As both teams battle for the honor of their community, an aggressive hit by Danny causes Reuven to suffer an injury that could maim him for life. After Danny shows up at the hospital to apologize, the two are transformed almost instantly from enemies to best friends, and Danny begins to share with Reuven his secret hopes for his life and future. However, the boys’ friendship is not without its obstacles: Danny is a Hasidic Jew, whose father, a tzaddik, believes passionately in upholding the traditions he was raised with, while Reuven is the son of a Jewish scholar who insists that their people simply cannot afford to wait for the Messiah. While Reuven believes himself the sole keeper of Danny’s secrets, Reuven’s father has his own secret: He has been recommending secular books to Danny at the boy’s request without his father’s knowledge. As the horrors of the Holocaust come to light and the Jewish community clashes violently over the creation of a Jewish state in Palestine, Danny’s father bans his son from having any further contact with Reuven or his father. During their years of friendship as well as their difficult years of estrangement, the boys confront their differences, question the traditions they know, and reexamine their faith as they consider their place in the world. As they move together from boyhood to manhood, they must forge their own paths and decide for themselves what it means to have a life filled with meaning and purpose. 1. Why do you think the author settled on the title The Chosen for this novel? To what does the term refer? Also, where do readers encounter the theme of being chosen or else actively choosing in the story? According to the novel, what, if anything, are we able to choose for ourselves, and what is chosen for us? 2. How are the schools that Reuven and Danny attend different? Why do the boys from each school exhibit such animosity toward one another in the play yard? Alternatively, what do all the boys have in common? Within the boys’ schools, how does Reuven say that brilliance is defined? How does this definition of intelligence compare to its definition in the outside world? Which kind of intelligence do Danny and Reuven seem to be most interested in? Explain. 3. Reuven says that he met Danny because of World War II. What does he mean by this? How does the war bring the two boys together? What does baseball represent according to Reuven? 4. What is an apikoros? Why does Danny refer to Reuven in this way? Why is Danny’s use of this term ironic? What does Reuven think the yeshiva team believes about the game and what it represents to them? Does he agree with their view of the competition? 5. What does Danny say to Reuven when he visits him in the hospital? How does Reuven respond to this? What advice does Reuven’s father give his son when Reuven mentions Danny’s initial visit? Why do you think he gives him this advice? Does Reuven take his father’s advice? 6. How is Reuven changed by the experience of his injury and recovery? Consider how sight and ways of seeing function as symbols and motifs thereafter in the book. What other examples are there in the novel of a character’s sight changing either literally or metaphorically, and what causes these changes? 7. What does Reuven’s father say is “the purpose of man” (page 98) and with what does he believe a man must fill his life? In what does Reuven’s father find purpose? What does Danny’s father believe his purpose is? Do either Reuven or Danny find their purpose by the conclusion of the story? If so, how do they accomplish this and what must they sacrifice in order to do so? 8. Although Reuven narrates the story, Danny also functions as a main character. Consider how we come to know the two characters by way of their relationship. What unites the two characters and how are they different? What common struggles do they face and how does each surmount them? What do we learn about each character through their relationship that we might not otherwise be privy to? 9. Explore the motif of silence. Why does Reb Saunders refuse to talk to his son except in association with his studies? How does Danny react to this? What do Reuven and his father think of the way Reb Saunders raises Danny? What other examples of silence are found throughout the novel? At its conclusion, does the book answer the question of whether silence is ultimately positive or negative, necessary or destructive? Explain. 10. Compare and contrast the father-son relationships in the book. What do the two fathers have in common and what divides them? How do the boys perceive their fathers? Describe how each man raises his son. What does each father try to teach his son or instill in him, and why do you think these lessons are important to the boys? Why does Reuven’s father say that he respects Danny’s father even though he disagrees with his beliefs? 11. How does each of the main characters react to the news of the Holocaust? Does this revelation unite the characters or set them further apart? Is this surprising? Why, or why not? 12. Consider the theme of suffering. Why does Reb Saunders believe that suffering is necessary? Does the book ultimately seem to support his view or overturn it? Explain. How do each of the characters suffer and how are they changed as a result of their suffering? Are the changes primarily positive or negative? 13. Examine how the backdrop of historical events helps to illuminate the major themes of the book. What major historical events are represented in the book? How do the characters respond to these events? What do we learn about the characters from their responses to these events? 14. Evaluate the theme of tradition versus modernity. Does the novel ultimately suggest that tradition is positive or a hindrance? Why does Danny’s father insist on carrying on the traditions he knows? How does Reuven’s father feel about tradition? Why is Danny ultimately willing to part with some of the traditions he knows? Do you believe that he made a good decision? Discuss. 15. Reuven’s father tells his son that he doesn’t know if it was ethical to give Danny books without Reb Saunders’s knowledge. Do you believe that it was ethical for him to do so? Why, or why not? 1. Reuven indicates that his entire perspective or way of seeing changed after his injury and recovery. Consider an event from your own life that altered your perspective in a major way. What was this event and how did it change you? How do you think you would be different today if this event had not taken place? What might this suggest about the usefulness of suffering, obstacles, and conflict in a person’s growth and development? 2. Use The Chosen as a starting place to discuss the subjects of intellectual freedom and banned literature. Danny spends much of his time in libraries secretly reading books that he knows his father would not approve of. Why doesn’t Danny’s father want him reading these works? Consider some other cultures that ban particular works of literature or place limits on intellectual freedom. Why are these works off-limits and what are some of the ramifications for reading such banned material in these cultures? You might consult PEN.org to explore this topic further. 3. Compare The Chosen to other works of contemporary literature that explore the subject of tradition versus modernity. In these works, which traditions are upheld and which are dispensed with? What significance do the traditions have for the characters who observe them? What place do you believe traditions have in modern culture? What are some traditions that you observe and what are some traditions that are no longer observed in your family or culture? Does the observance of, or adherence to, tradition necessarily limit progress? Discuss. 4. Consider the book’s exploration of Zionism. Why do the characters in the novel have such passionate views on this subject? What tragedy helped them to find some middle ground or bring the issue closer to home? Have the prejudices and conflicts reflected in the book around this topic been resolved today, or do they still exist? If they still exist, does the book seem to offer any suggestions as to how this might be remedied? Chaim Potok was born in New York City in 1929. He is the author of nine novels, including The Chosen (1967), The Promise (1969), and My Name is Asher Lev (1972), as well as three plays, three children’s books, and three works of nonfiction. An ordained rabbi, he served as an army chaplain in Korea and received his PhD in philosophy from the University of Pennsylvania. He died in 2002.